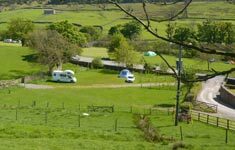 Scabba Wath Camp Site is near Reeth in beautiful Swaledale, at the heart of the Yorkshire Dales National Park. For walkers the camp site offers many walks from the door and is just one mile from the Coast-to-Coast Walk. As well as walking, the area is ideal for outdoor pursuits such as mountain biking, fishing, caving, pony trekking and bird watching. Nearby Reeth offers pubs with food, shops, post office, garage and tea rooms. Pitches with roadside frontage to the B6270 - part of Le Tour de France 2014 Route - are available for booking now. The photo to the right below shows cyclists following the route past the campsite access gate. the River Swale offering pretty riverside routes. 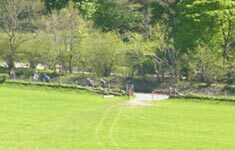 Scabba Wath Camp Site Facilities The camp site is situated next to the River Swale on Low Whita Farm in Low Row. There is a choice pitches with electric hook ups and water tap and pitches without. There is a shower block with washing facilities. We welcome camper vans, caravans with cars, family tents and small tents.